Geological units of the Preveza Peninsula are included in the Ionian zone of the external Hellenides. The peninsula is formed by sedimentary rocks only. These are limestones and dolomites of the Triassic and Jurassic age; as well as limestones and shales of the Mesozoic and Tertiary ages. Shales of the youngest formation of the Tertiary (Neogene) age partially contain coal seams. The thickness of seams ranges from several centimetres up to 1.5 metres. Shale with coal seams is very well exposed in the seaside between Ag. Triada and Agii Apostoli (fig. 5). The sediments exposed on the shores of the Ambracian Gulf show that the entire bay had the form of a large freshwater lake in the Neogene period. The oldest layer is formed by seams of lignite coal. The top surface includes a clay layer containing the shells of gastropods (genus Melanopsis) and of bivalves (Molluscs). A lignite layer records the existence of a marsh ingrown by vegetation. After the water level rise, the peat bog flooded. This resulted in a lake, on the bottom of which molluscs lived. The youngest layers of the Holocene cover the Neogene layers. From here, it continues along the seaside of the Ambracian Gulf further to the south-east. 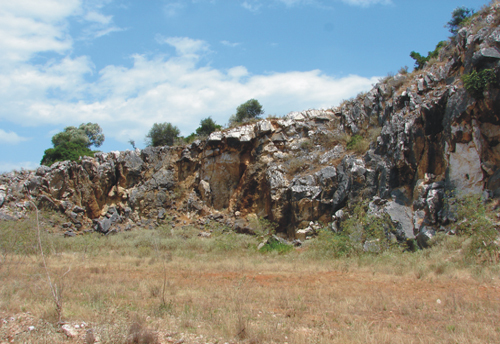 Limestones are exposed on the surface on the south-eastern and southern edge of the Preveza Peninsula on short and low ridges. 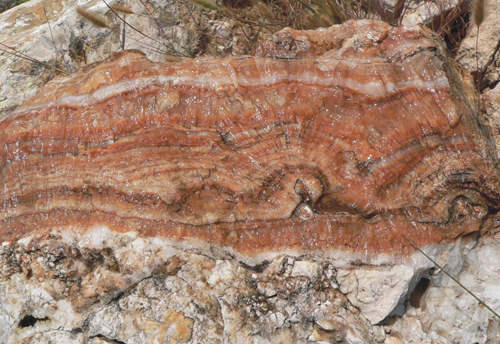 The limestones are strongly karstified with the surface covered with karren (fig. 1), which also create continuous karren fields. Fig. 1. Heavily karstified limestone karren. Fig. 2. The upper quarry in Ag. Thomas is formed by Triassic and Jurassic limestones. Fig. 3. Re-crystallized and significantly Fe coloured sinter formed by calcite. Fig. 4. Karstified surface of limestones modelled by sea water. The best exposure of the Mesozoic (Triassic and Jurassic) limestone layers can be seen in abandoned quarries near the village of Agios Thomas (fig. 2). Major tectonic structural elements – stratification (direction of placement of the limestone layers) are clearly visible, as are the longitudinal and transverse caverns which are created in several systems in the quarry. 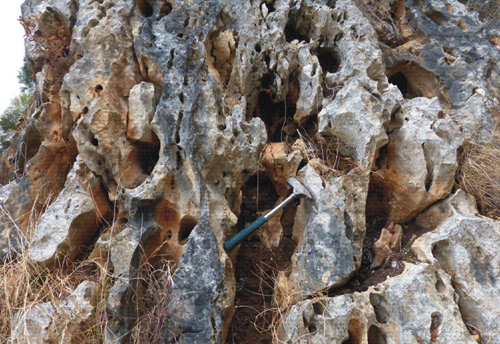 In these quarries, the limestones present obvious karst phenomena of minor extent: cavities, smaller caves, embryonic canals and karstified caverns with re-crystallized calcium aggregates (fig. 3) or with stalactites. In many places, the limestones contain multicoloured straw-shaped calcites or various clustered forms of calcite crystals, streaks of white and yellowish calcite and calcareous concretions. 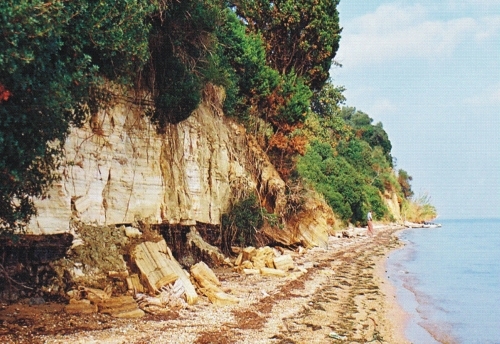 Limestones on the eastern to southern end of the Preveza Peninsula are heavily karstified and formed by sea water (fig. 4). Different types of limestones and formations of their karstification (corrosion, erosion) can be seen in the little vitrines. A substantial area of the Preveza Peninsula is covered by unlithified Palaeogene and Neogene sediments formed by fluvial gravel and fluvial and lacustrine sand. The youngest sediments are then quaternary fluvial, deltaic and lacustrine sediments. A typical feature of fluvial and deltaic sands is the cross bedding in sands that is clearly exposed under Ag. Apostoli (fig. 6). The wall reveals unconsolidated Pleistocene sands with cross-bedding. With advancing sea erosion on the shore (abrasion), the land has eroded by 250 metres within a period of 300 years. It also caused the collapse of the little church in Agii Apostoli The sand and gravel between Ag. Triada and Ag. 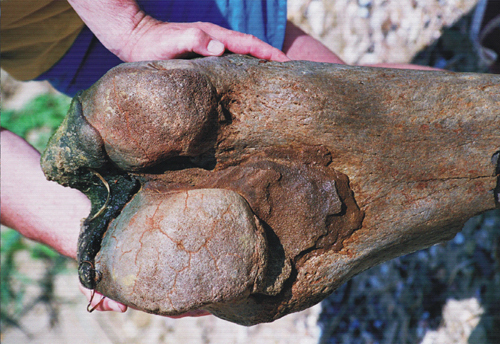 Apostoli contain bones of Pleistocene animals (fig. 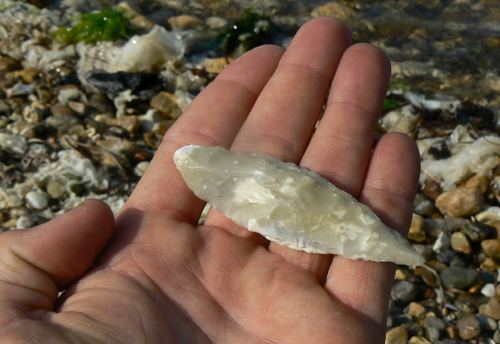 7) and prehistoric stone tools from the Palaeolithic era, which are about 25,000 years old (fig. 8). The top layers of the peninsula are covered with high quality soils with humus horizons. These soils are ideal for agriculture and for growing both vegetables and citrus fruits. Fig. 5. 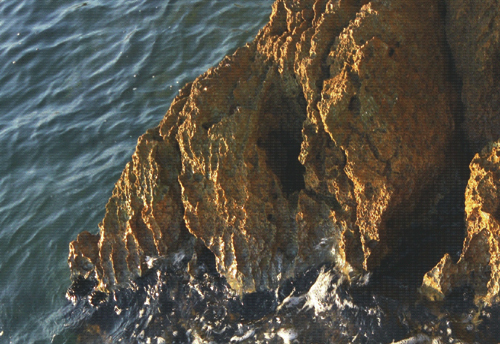 Shale with coal seams is very well exposed in the seaside in Agii Apostoli. Fig. 6. 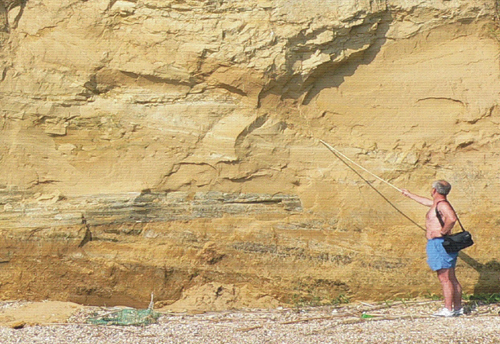 The wall reveals unconsolidated Pleistocene sands with cross-bedding. Fig. 7. Discoveries of bones of Pleistocene animals for example Laxodonta antiqua. Fig. 8. Prehistoric stone tools from the Palaeolith.